Do you support shutting down the government unless Trump gets funding for his border wall? 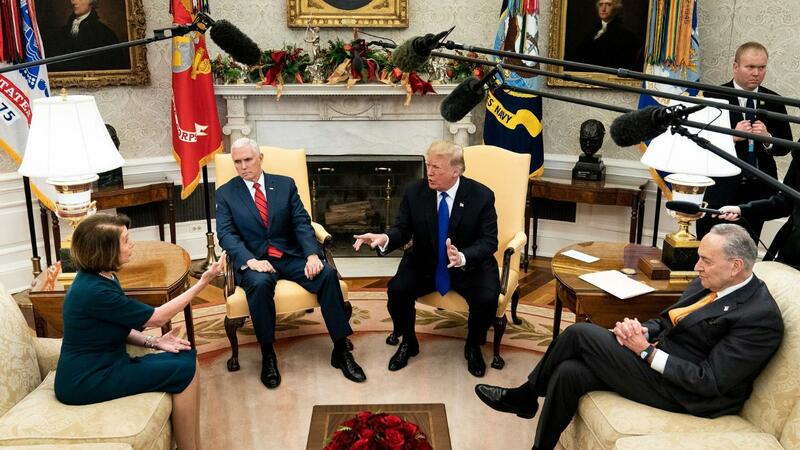 Prior to his meeting with Rep. Nancy Pelosi and Sen. Chuck Schumer, President Trump brought reporters into the Oval Office and — in an extended, heated exchange before the cameras — clashed with the two Democratic leaders over congressional support for funding for his border wall, declaring that he is "proud to shut down the government for border security." Why it matters: The president taking ownership of any potential government shutdown hinders Republicans' ability to pin the blame on Democrats, while also giving a glimpse into what Trump's negotiating style with a Democrat-controlled House may look like over the next two years. Trump has demanded $5 billion for the border wall, but Schumer has drawn a red line on providing no more than $1.3 billion — not for a wall, but for border security. "This temper tantrum that [Trump] seems to throw will not get him his wall and it will hurt a lot of people because he will cause a shutdown," Schumer said in a press conference following the Oval Office altercation.